In January, I like to reflect on what has and hasn’t worked in my overall plan for enjoyment in the garden. I’m always looking for ways to make things more functional and easily accessible where they are used. I love trying new ideas that reuse and recycle salvaged items. Here’s a look at some of the projects we have done to solve common issues that many of us have with our gardens and decks. It is so handy to have the patio umbrellas right where we need them. We installed a bay window in the kitchen where there had been three flat windows. This created a new exterior space underneath that was the perfect size to store patio umbrellas. Wooden panels were attached to the deck with angle brackets with one on a hinge to serve as the door. We designed a cart on small casters to easily roll the umbrellas in and out of the space. 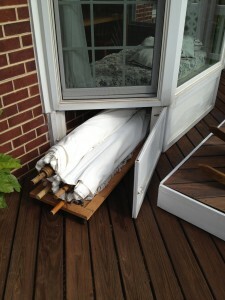 No more lugging the umbrellas all the way to the garage anymore; they are right where we need them. For more storage on the deck, we made a deck box to hold the chair cushions when not in use. We used salvaged wood from a fence that had fallen, so it was also a great reuse of materials. The deck box doubles as seating or as a serving/bar surface when entertaining. Whenever possible, try to double up on function for every piece of furniture. That way if you decide to change things around you won’t be left with something that has only one purpose, and no longer has a function. This deck box holds all the chair cushions, and doubles as party seating. 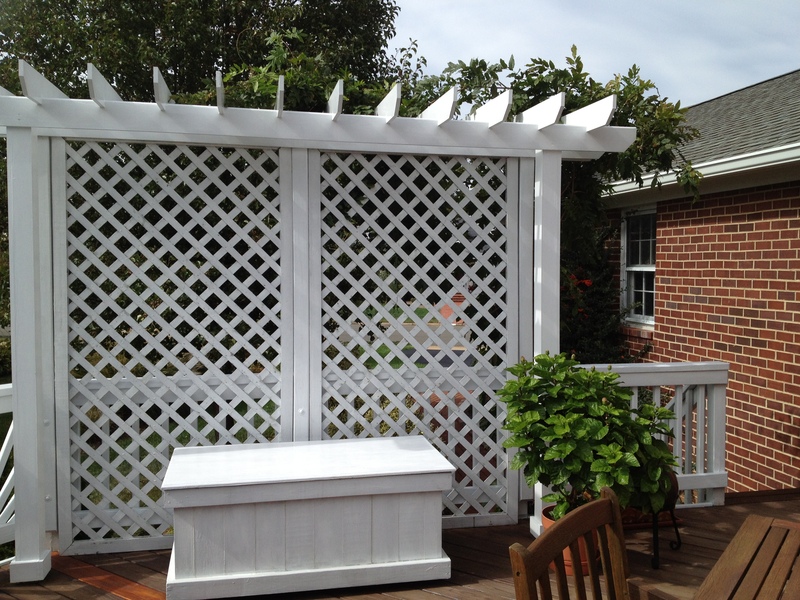 The lattice panels in the arbor are easily removable to prepare for storms. The deck on our house is visible from the street and has little shade. 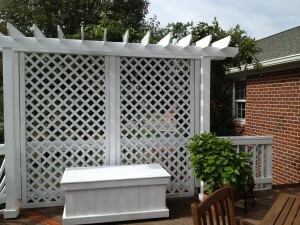 To help with both of these issues we designed an arbor that works well for many reasons. Also, I have a wisteria growing upon one side so it needed to be very strong. We take on quite heavy winds here during storms, being close to the water. Our answer to these issues was to double up on the supports for extra strength, and make the lattice privacy panels easily removable (they just lift out). Now we are covered for sun, privacy, and winds! A seating platform raises the area to the perfect viewing height above the rail. When sitting in our Adirondack chairs on the deck, we used to have the water view ruined by the (legally-required) rail which is right at eye level. We came up with an idea which works great: a floating-deck raised platform for two of the deck chairs. Now, we have a perfect view of the water. This platform was also built with scrap lumber. 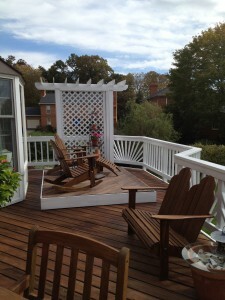 As it is just one step up and floats on the deck, it can be moved around for the deck’s annual deck wash/seal. This coming year I hope to add several more improvements: I would like to incorporate a coldframe to grow lettuce and other veggies year round, using the windows which were removed when we installed the kitchen bay. Also in the works: A re-vamp of the underground irrigation system with more efficient, better-located sprinkler heads. I am hoping to save countless hours of watering in the heat of the summer. More on these in future blogs. I hope some of these ideas might be solutions for you, and as always I’d love to hear what new things you have dreamed up for your gardens in the new year.